The Mineral Mountains, located in Beaver County, make up the largest exposed plutonic body in Utah. Rock compositions range from quartz monzonite in the northern half of the pluton to granite around Rock Corral Canyon in the south. 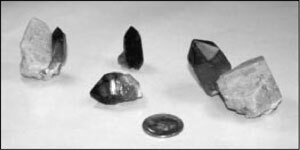 Excellent crystals of smoky quartz and feldspar are found in vugs or cavities in the granite. They formed when cooling fractures in the granite were filled by late-stage pegmatites consisting of quartz, microcline, and plagioclase. Quartz occurs as clear to smoky, euhedral crystals up to three inches long while microcline is commonly found as euhedral, equidimensional crystals averaging approximately 0.75 inches in width. Occasionally, large pseudomorphs of limonite after pyrite can be found in these areas as well. Travel 0.7 miles south of the railroad tracks on State Route 21 from Milford where a Corral Recreation Area sign will instruct you to turn left (east) from the highway. This road is paved for a short distance but then turns to sand. Continue from the turn-off 5.4 miles to an intersection. Take the left fork and continue for 1.2 miles to another intersection. Keep right at this intersection for 2.7 miles to the first outcrop or inselberg on the left. You can park here or continue to the picnic area in Rock Corral Canyon. Although the quartz and feldspar are not confined to Rock Corral, the best-developed crystal specimens seem to occur within a half-mile radius of the picnic area. As mentioned above, the crystals are found in vugs. Look for areas where the quartz and feldspar are easily visible as coarse veins. Examine these areas closely as occasionally they open up into cavities where the crystals had space to grow. Beaver and Wah Wah Mountains South 1:100,000-scale maps, and a Utah highway map. These are best for navigational purposes. Also, the Adamsville and Bearskin Mountain 1:24,000-scale maps. Topographic maps can be obtained from the Natural Resources Bookstore, 1594 W. North Temple, Salt Lake City, UT 84116, (801) 537-3320, FAX (801) 537-3395. A hat and water are essential. Tools recommended : Safety glasses, hammer, chisel, and patience are a must. Have fun collecting! Dustin L. Rooks is a Junior at Southern Utah University where he is majoring in both geology and botany. He is a native of Vernal, Utah where he spends summers conducting range studies for the National Forest Service and collecting rocks, minerals, and fossils.